The galvanised steel single door wall mounted enclosure range, MASE, is designed to meet EMC requirements. An excellent Faraday effect is created, since electrical conductivity between the enclosure body an door is guaranteed. The risk for component failure, and with that unnecessary downtime, is eliminated as electromagnetic interference is avoided and water and dust are prevented from entering the enclosure. This enclosure range is well suited for applications where EMC is required. All the MAS standard sizes are available as an EMC version on request. MASE: From 200/200/155 mm to 1200/800/400 mm. e.g. 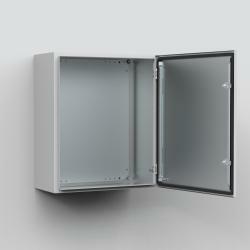 MASE0606021R5, EMC single door enclosure 600 × 600 × 210 mm. For more details please see MAS table. SPDEG - ✔ - This EMC gasket maintains the EMC properties when separation plates are used between two bayed mild steel combinable floor standing enclosures. EFAE - ✔ - EMC exhaust filter, that maintains the EMC properties, for natural ventilation or a filter fan. EFE - ✔ - EMC filter fan, that maintains the EMC properties, for forced ventilation within the enclosure. Body: 1.2 mm zinc plated steel / 1.4 mm MASE0606021R5 and above. Door: 1.2 mm zinc plated steel / 1.4 mm MASE0606021R5 and above / 1.8 mm MASE1006026R5 and above. Mounting plate: 2 mm galvanized steel. Surface mounted with 130° opening. Concealed removable hinges with captive pin. Hinges are mounted for right hand opening only. From size MASE0505021R5 and above there are two removable mounting profiles on the door. Sealing is ensured by a conductive EMC gasket. Chrome plated double-bit lock, with 3 mm insert and 90° movement. 1000 mm high enclosures and above have espagnolette three point locking system. The mounting plate is marked vertically at 10 mm intervals, for easy horizontal positioning of equipment. On the top and bottom are holes to facilitate cable fixing. Fixed on to M8 press welded studs to the rear of the enclosure. All sides from 800 mm and above are strengthened by folded edges. By using the AMG accessory, the mounting plate can be adjusted to any depth. No gland plate opening, to ensure maximum EMI protection. The door is earthed by means of a separate earthing stud M8. RAL 7035 structured powder coating on the outside only. IP 54 | TYPE 12 | IK 10. Zinc plated enclosure body and door, painted on the outside. Door equipped with EMI conductive gasket. Two door mounting profiles, from size MASE0505021R5 and above. Earthing facilities. Galvanised steel single door wall mounted enclosure, designed to EMC requirements. Electric conductivity between the enclosure's body and door is guaranteed, which ensures a good Faraday effect is created. Component and equipment failure, and unnecessary downtime is avoided as the components are protected from electromagnetic interferences as well as from water and dust entering the enclosure. Only EMC rated accessories or peripherals that affect the enclosure's external walls should be used, using other accessories or peripherals will downgrade the enclosure's EMC performance.